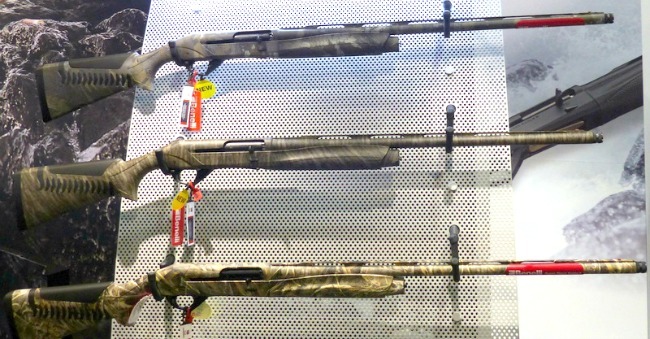 Benelli SBE3 shotguns at the 2017 SHOT Show. Photo by Randy Wakeman. SBE3 Owner: "When aiming, it should hit at that spot, not over a foot high. I had three other people try it and all shot the same. They threw on a bigger bead and said I can put this on to help it shoot lower on the water, etc. Try shooting a gun that patterns like this at a turkey head! Where do you aim at each distance? Maybe I have a bad one, but just wanted to let you know what you may get. One of the guys at Benelli said once he learned to shoot his like this, no problem. I asked him what if you shoot different guns, do I relearn every time? If this is the new Benelli's, I guess I am through with them." SBE3 Owner: "Patterned mine this afternoon with six different types of ammo out of the factory Imp.Cyl. and Mod chokes. For one disappointed in the factory chokes, which has almost become accepted these days even in a close to $2000 gun, makes you wonder if the big B's get a kick back from aftermarket chokes to send a gun out with such terrible chokes. The worst part though is my gun is also shooting a foot high with I would say a 95/5 pattern at best." SBE3 Owner: "I went out and patterned my SBE3 today and it shoots 100% high. Next week I am going to shoot it with the Full choke and see what it does at 20 yards. I thought it'd be a little high, but most loads I shot were high with only 2-6 pellets at the POA. This is kinda ridiculous if you ask me, I used the stock extended Mod, a jebs choke and a Carlson Cremator mid range. All shot high." SBE3 Owner: "I bought an SBE3 about a month ago. The first time I took it out, it seemed to fringe hit the ducks. Finally, I had to shoot at a cripple on the water. He was about 40 yards out. Shot at him a couple of times and couldn't see where the BB's are hitting. I took it to a pattern board and it was shooting way high. I have shot all kinds of shotguns and several Benelli's. I was using a 34x34 inch piece of paper with a three inch bullseye. At a measured 35 yards, half of the pattern was at the top of the paper the other half over the paper. I tried different chokes etc. I called Benelli and they said they are made to shoot like that. To make a long story short, I sent it back and they said the gun is fine, within their parameters." I have more comments like this I could quote, but you get the point. What is going on? Well, the Benelli patent published on October 1, 2003 offers the explanation. Inventor Luciano Burigana had the collapsing gap in his "stock for firearms" which later was sold as the Comfortech stock. The original Comfortech stocks were fairly rigid, however, and did not do much. The later generation of Comfortech stocks, the Comfortech II, offered more flex (as installed in my M2) and did a far better job of managing recoil. For the SBE3, the Benelli brand of Beretta has the Comfortech 3. Benelli says, "The chevron size and location has been optimized on Comfort Tech 3." The SBE3 stock has far more flex than previous Comfortech versions and consequently is more comfortable to shoot. I can readily feel the difference with 1-1/8 ounce target loads. The unintended consequence of this is not taking the extra flex and more rapid stock gap collapse into consideration when machining the receiver. As a result of the close to instant collapse of the stock gap, the patterns throw excessively high, over the heads of turkeys, potentially crippling ducks with only the lowermost portion of the pattern. The Benelli Nova Comfortech stock has far less flex, does little for recoil attenuation, but also does not create point of impact issues. Many shotguns do not shoot exactly to point of aim, to be sure. I actually prefer a hunting shotgun that throws slightly high. The 60/40 percent pattern that some like to talk about is putting the center of the pattern three inches high at 40 yards. This allows some built-in lead for a rising bird. However, a 100/0 pattern is not an acceptable wing shooting pattern, as that is fifteen inches high at 40 yards. As shooters are discovering, the radically skeletonized buttstock of the Benelli SBE3 is a jellyfish, essentially guaranteeing not only an excessively high point of impact, but an inconsistent point of impact, changing in concert with load intensity. Reportedly, Benelli's official specifications are zero to six inches high at 21 yards and within four inches of the bull horizontally. You can call that type of a tolerance what you wish. I have to call it a nasty mess. Unless otherwise claimed, hunting shotguns should shoot approximately to point of aim at 40 yards. Dedicated trap guns most often shoot 60/40 to 70/30, meaning about about three inches to six inches high at 40 yards, as trap targets are always shot when rising. If my Fabarm L4S Grey Hunter threw more than three inches high at 40 yards, it would be defective. It doesn't. If my Remington V3s, Browning B-80s, Benelli M2s, Browning Automatic-Fives, Mossberg SA-20, 870 Wingmasters, Browning Cynergys, Beretta A303s, or any of the five Browning Maxus models tested threw significantly more than three inches or so high at 40 yards, they would also be defective. They do not. Any hunting shotgun that blows patterns eight, 10, or 12 inches high at 40 yards is defective, regardless of who made it, who owns it, or where it was made.